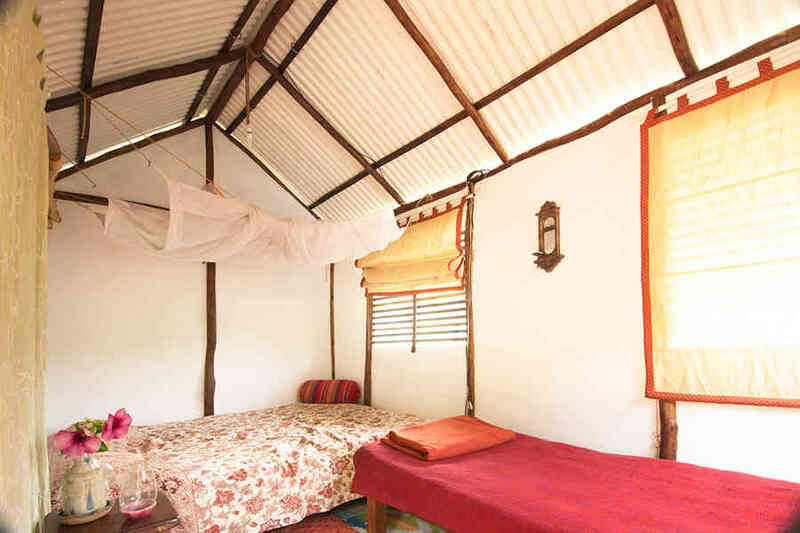 Use the form below to inquire about Eco-Friendly Homestay at Castle Rock . 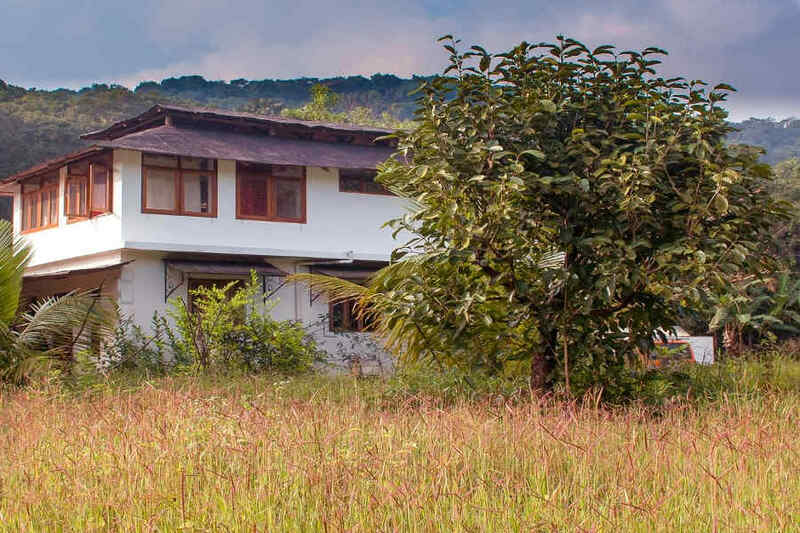 Use the form below to reserve for Eco-Friendly Homestay at Castle Rock . These can accommodate a double and single bed or 3 single beds. The cabins have a sit out with views of the stream and jungle. 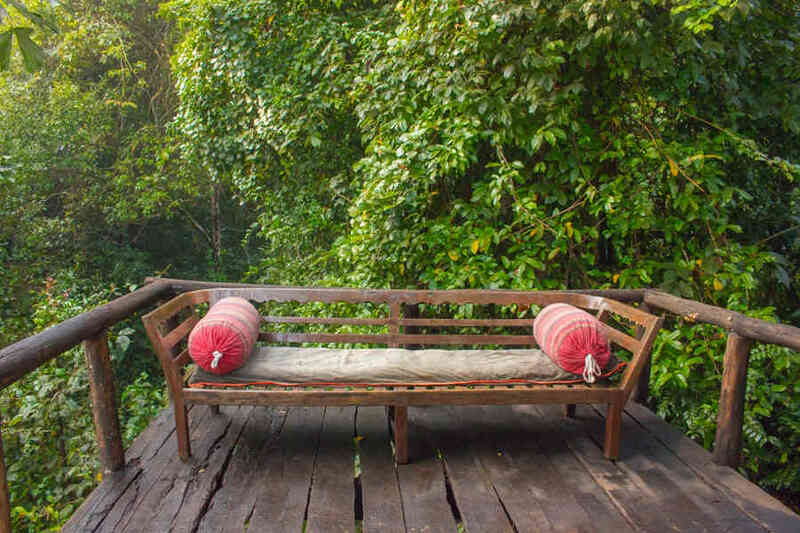 Disconnect from the chaotic world as you rejuvenate at this Eco-Friendly Homestay at Castle Rock amidst the dense jungle. 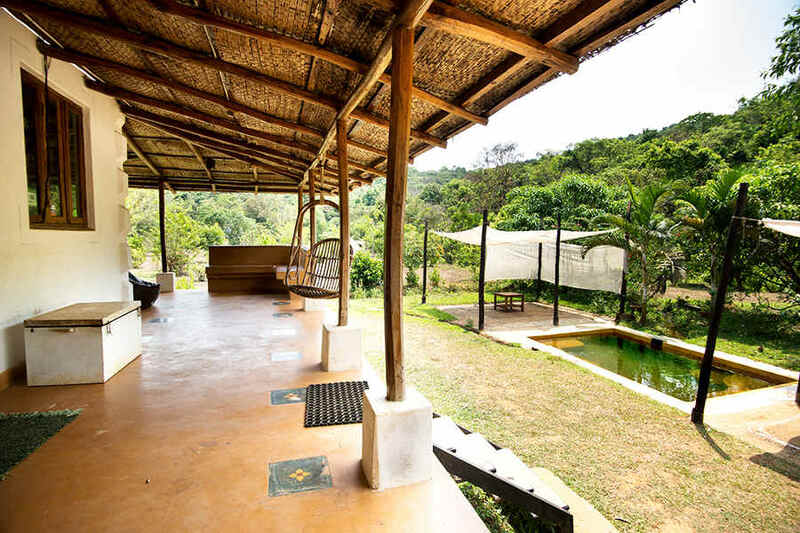 Situated on the Goa-Karnataka border, this Eco-Friendly Homestay at Castle Rock is a little oasis with the sounds and sights of nature for company. 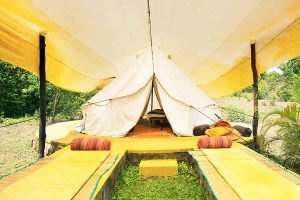 Sitting at an altitude of 2000 feet, this charming little property within the Western Ghats offers you birdsong and the call of the wild for company. The babbling of the stream flowing by and the starry sky at night afford you a mesmerizing experience. 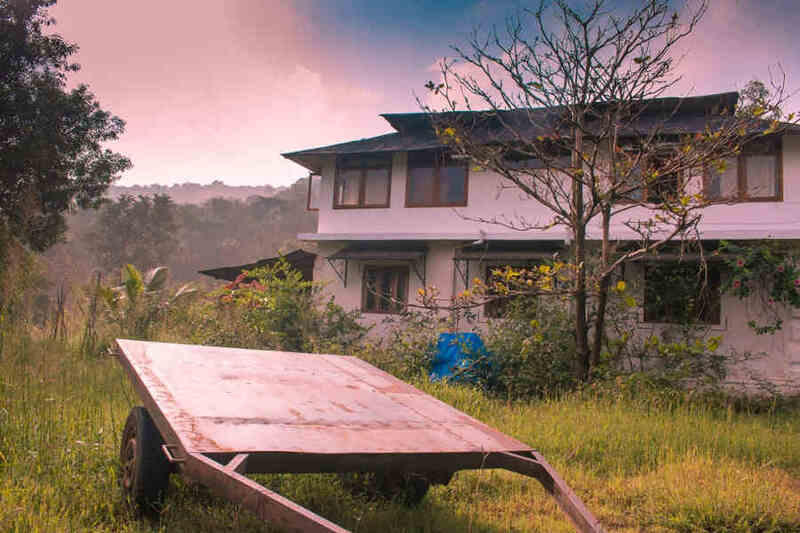 Epitomizing eco-friendly living at its optimal, Eco-Friendly Homestay at Castle Rock makes use of solar energy for lighting, sources water from a waterfall, and brings in firewood from the forest for use in the ovens, grills, and stoves across the property. 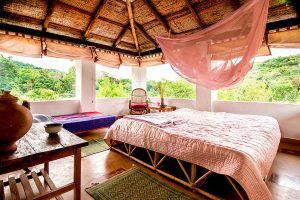 Rice, fruits, and vegetables are all grown on the property around this Eco-Friendly Homestay at Castle Rock in an organic manner. Meals are served at fixed times and specialties on the menu are Indian, Asian, and European dishes that focus on grilling or cooking on a wood fire. You are sure to relish the oven-fired pizzas, barbecue items, and homemade breads. The menu is mostly vegetarian and meals are served at the dining table near the stream or around the campfire at night. Swimming in the waterfalls, trekking, spotting wildlife, and bird watching are some activities you can indulge in. Different types of workshops are regularly held and a pottery kiln is also being constructed. There are three type of accommodations available at this Eco-Friendly Homestay at Castle Rock—the stream facing cabin with a private sit-out, rooftop rooms suitable for families which are elevated and thus airy, and the furnished tent which promises a camping experience for a family or couples seeking some romance. All rooms are provided with hot water. 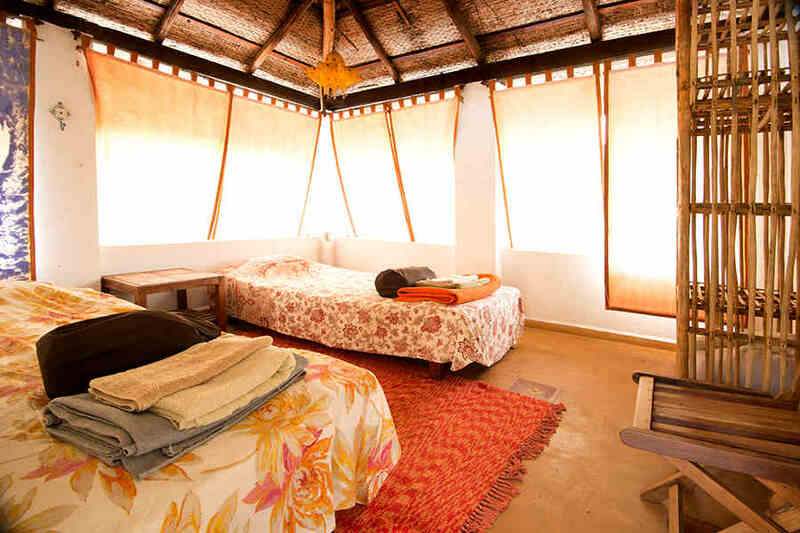 If communing with nature in peace is your idea of a perfect holiday, then this is the place for you! The menu is mostly vegetarian and meals are served at the dining table near the stream or around the campfire at night. A 25% advance to confirm a booking and this is non-refundable. Children above 5 are half price and they will be given a shared room with adults. The exotic location of this homestay makes it possible for you to enjoy a good many outdoor activities in and around the property. 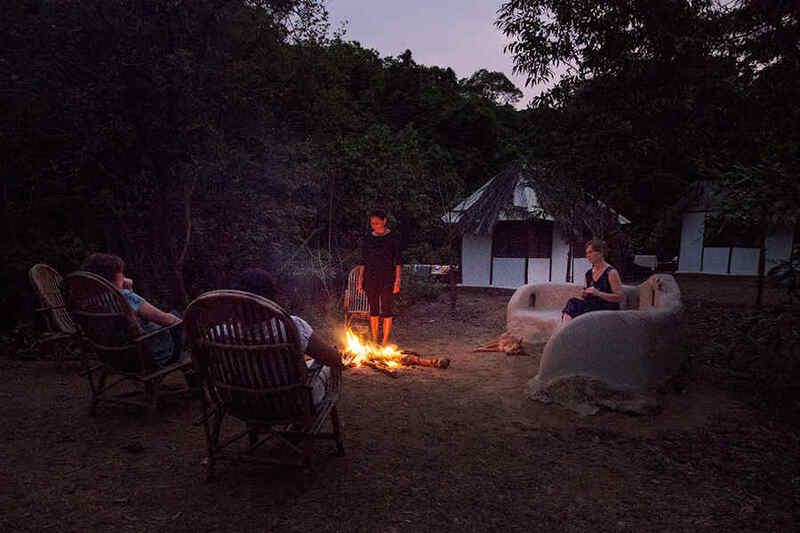 Besides relaxing in your room at the homestay and enjoying the scenic vistas around, you can also gaze up at the starry night sky as a crackling campfire keeps you warm. Various kinds of workshops targeted at children, families, artists, potters, and bird watchers are held on a regular basis. There are a wide range of outdoor activities that can try out while you are here. 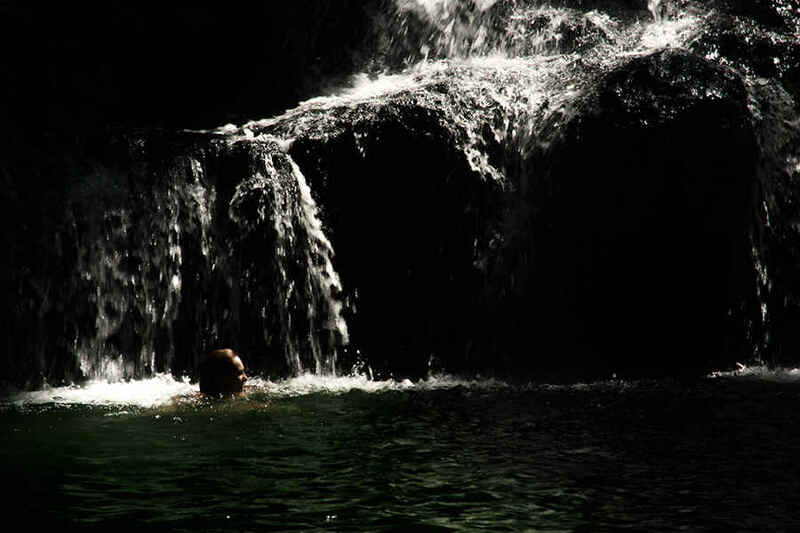 A great many secluded beautiful waterfalls around which make for good places to go swimming. Being strategically located within the Western Ghats, wildlife can be found in plenty with sightings of the Indian Gaur, Sloth Bears, porcupines, and deer commonly reported. The occasional leopard cannot be ruled out either. Trekking is the best way of getting to know the forest better and the forest department conducts guided treks right up to the pinnacle of Dudhsagar waterfalls. Bird watchers are bound to get an eyeful with species such as Great Indian Hornbill, Rufous Babbler, Asian Fairy Bluebird, and Flame-throated Bulbul to name a few. Dabolim Airport, Goa, is the nearest at 91 km while Pune Airport is 419 km away. Kempegowda International Airport, Bangalore is at a distance of 514 km. Castle Rock railway station is just 10 km away while Londa Junction is at 35 km. Madgaon railway station is at a distance of 73 km. Bangalore railway station is at 488 km. Dandeli is at 43 km via Mirjan-Ramnagar Road and Castle Rock-Jagalbet Road. Belgaum is at 70 km travelling along NH748 while Panaji is 90 km via NH748. Mangalore is at a distance of 388 km while Bangalore is 495 km away.